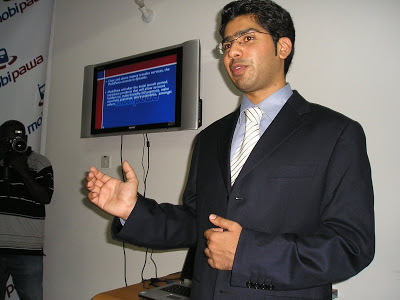 At the age of 19 Nadeem Juma established an international school in Tanzania for the sole purpose of bridging the gap in the market in regards to quality education at an affordable rate. Today, in his early thirties, he is the Chairman of AIM Group, a digital content agency, Efulusi Africa, a research and development company for mobile payment solutions, and Mkito, a music download site, one of the biggest in the East African region. CNBC Africa's George Ndirangu spoke to Juma on his journey to becoming a serial entrepreneur as well as balancing profit and social impact. 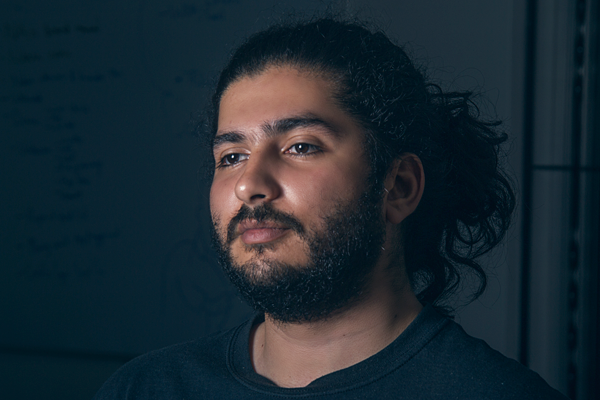 Our Game Changer is Nadeem Juma co-founder and chairman of a research and development (R&D) company that developed and deployed the first mobile banking platform in Tanzania. 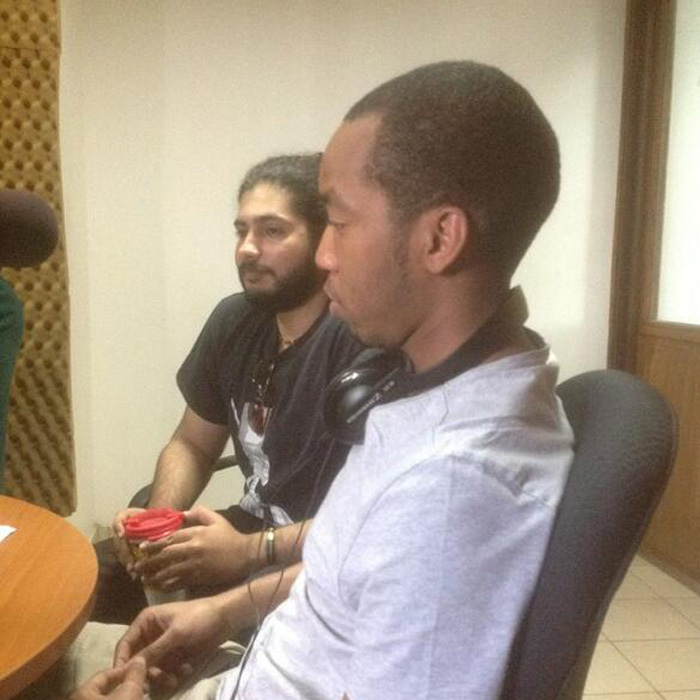 Juma is also the co-founder and chairman of AIM Group, the first new media agency based in Tanzania. 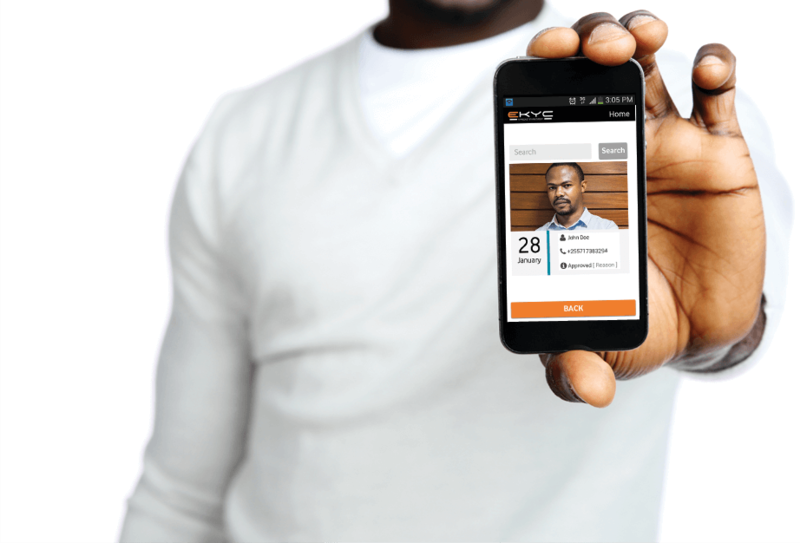 And was named by Forbes Africa magazine as one of 30 entrepreneurs to watch in Africa. 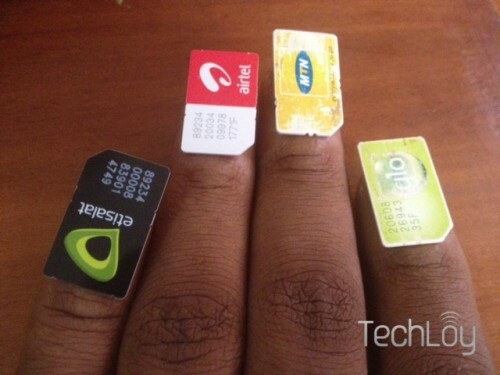 The increasing level of fraud, terrorism and other illicit uses, are part of major reasons regulators across Africa must not soft-pedal on the clampdown on unregistered SIM cards, in addition to the massive benefit to MNO’s for additional services to be provided, said Nadeem Juma, the chairman and co-founder of AIM Group. AIM Group is an innovation and digital agency founded in Tanzania focused on R&D, digital communications and creating enterprise and business solutions that have been shaping consumer experiences since 2009. In light of the recent fine that MTN Nigeria faces for their alleged non-compliance with customer registration regulations, I thought I would offer lessons learned in Tanzania and how they may be applicable to Nigeria and the rest of Africa and share what I believe the implications of this crackdown are. 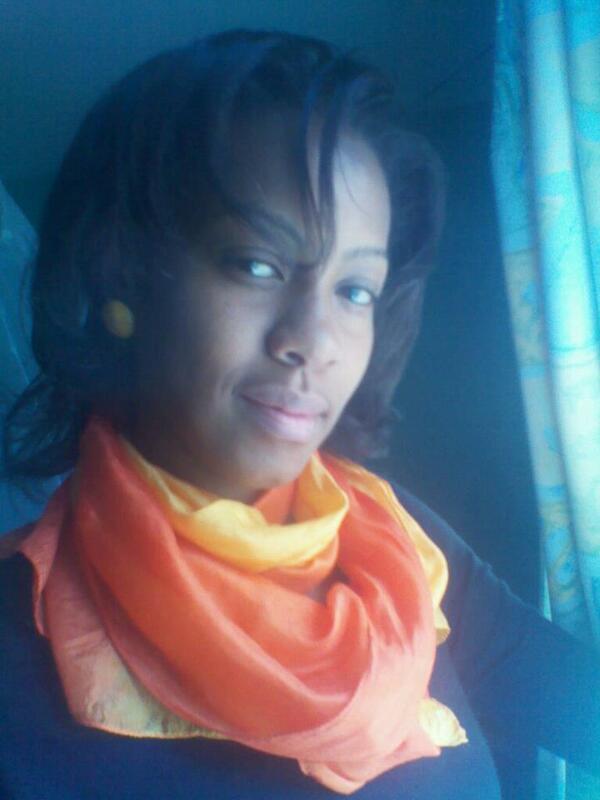 Esther Maina recently had the honor of speaking at the Mobile East Africa 2014 event. She chose to speak on social data. In a bid to demystify the phenomenon that is big data. Maina set out to give a brief intro on just what the social data revolution was about. The world has so far experienced three major revolutions: Agrarian, Industrial and Information revolution. 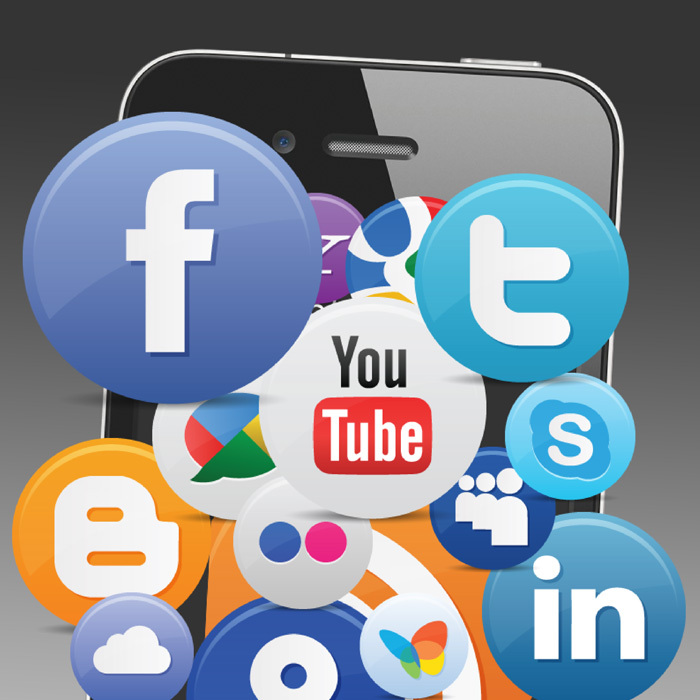 We are currently witnessing the fourth revolution which is social data revolution. Social data revolution (according to Wikipedia), is the shift in human communication patterns towards increased personal information sharing and its related implications, made possible by the rise of social networks in early 2000s. This phenomenon has resulted in the accumulation of unprecedented amounts of public data. The AIM Group in Tanzania was founded in Dar es Salaam by three siblings; Nadeem Juma, Shaista Juma and Hafiz Juma. The company initially focused on infrastructure deployments that made use of digital content such as interactive kiosks, motion-controlled projections and installations. It is now involved in a number of projects, including the Dar es Salaam International Academy and Efulusi Africa, a research and development company for mobile payment solutions. The design team was privileged to fly to LA to experience great innovation that they took back with them to apply in the industry. We came back stronger, better and innovative to its highest standard! Mobile Web East Africa 2013, the third East African edition of the most progressive and interactive mobile focused events in Sub-Saharan Africa. The event features the very best local and international speakers from organizations including Safaricom, iHub Research, iROKO Partners, Buni TV, East African Breweries, FrontlineSMS, BlackBerry. 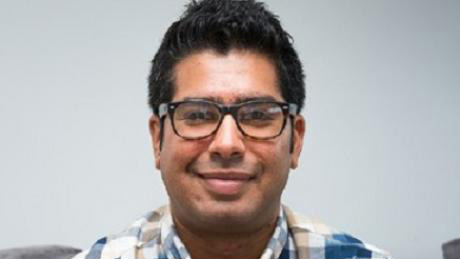 Nadeem Juma, the chairman of AIM Group and Hafiz Juma, art director at AIM Group were among the great speakers at the Mobile Web East Africa 2013, who covered 'mobile marketing case studies'. The South by Southwest (SXSW) Conferences & Festivals offers the unique convergence of original music, independent films, and emerging technologies. 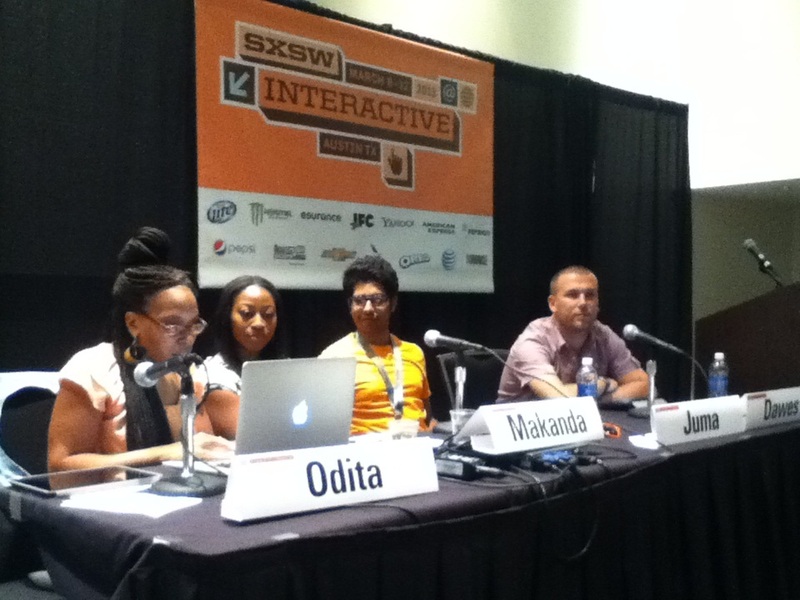 Fostering creative and professional growth alike…" (www.sxsw.com). In 2013, AIM Group Chairman, Mr. Nadeem Juma was given the unique opportunity to be part of a panel discussion talking about the Web in Africa. Not only was Nadeem Juma the first East African to be invited to speak at South by Southwest, according to David Tereshchuk a Print, broadcasting and web journalist, this panel was one of the high points of the 2013 SXSW. The Link is a radio show connecting young Tanzanians working in the corporate world, entrepreneurs & entry level aspirants with their peers. 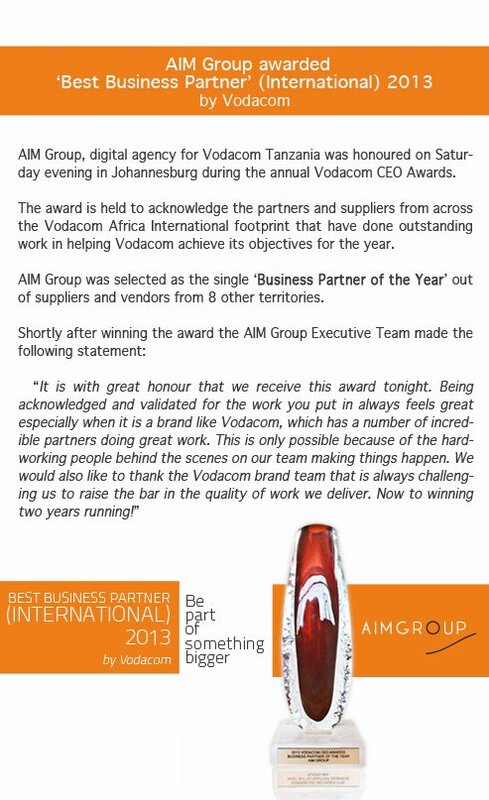 On November 2nd 2013 AIM Group was awarded Best Business Partner 2013 for Vodacom International. This is a single annual award selected from partners in all Vodacom operations. "Beautiful locations rich flavors bringing you the WHO and what of Tanzania"
Capital Television, IPP Media Group have developed a weekly lifestyle program called "Sights & Sounds", produced by Tendai Karonga. In July 2013, AIM Group was given the opportunity to feature on "Sights & Sounds" and have a candid discussion on how AIM Group started, where it is going, how it is run and what AIM Group's corporate culture represents. 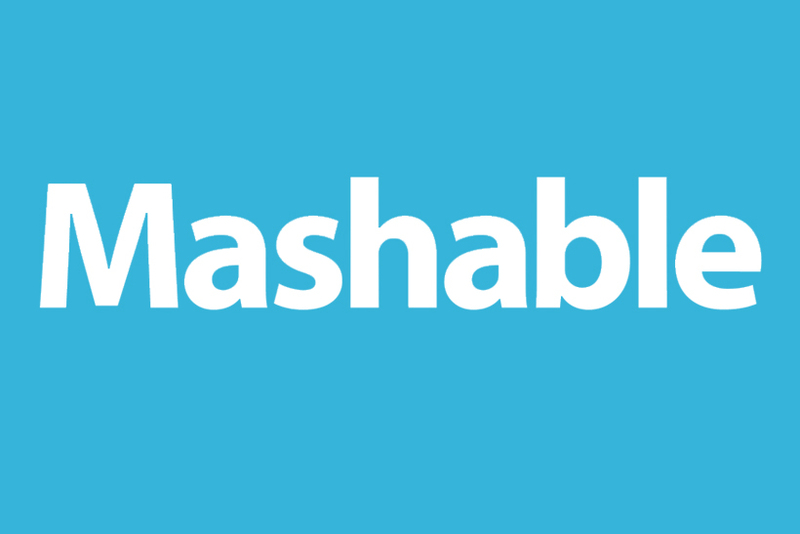 "Mashable.com covers the top social media news on topics like Facebook, YouTube, Twitter, Amazon, Pinterest and More." 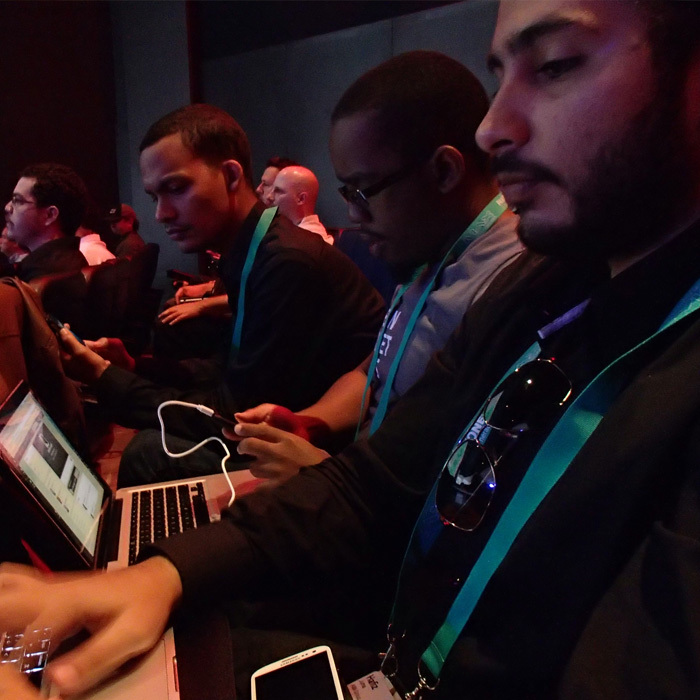 On June 6th 2013, Monty Munford wrote on mashable.com about the "20 Important African Startups to Watch", which currently has been shared 5.1k times. AIM Group ranked number 6 out of 20 and Monty went on to say; "This digital agency is disrupting the media, marketing and brand space by harnessing social media and traditional communications". 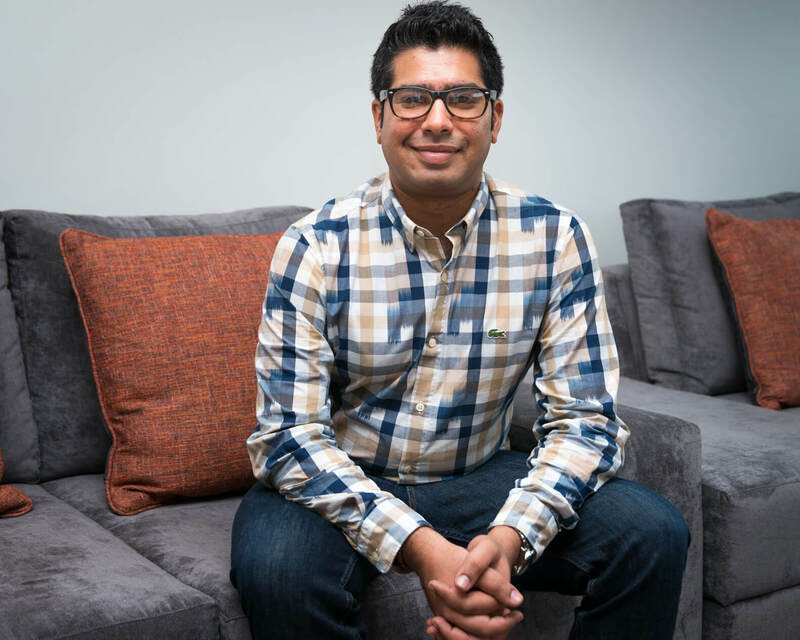 Nadeem Juma established an international school ten years ago at the age of just 19, and is the co-founder and chairman of a research and development (R&D) company that developed and deployed the first mobile banking platform in Tanzania. 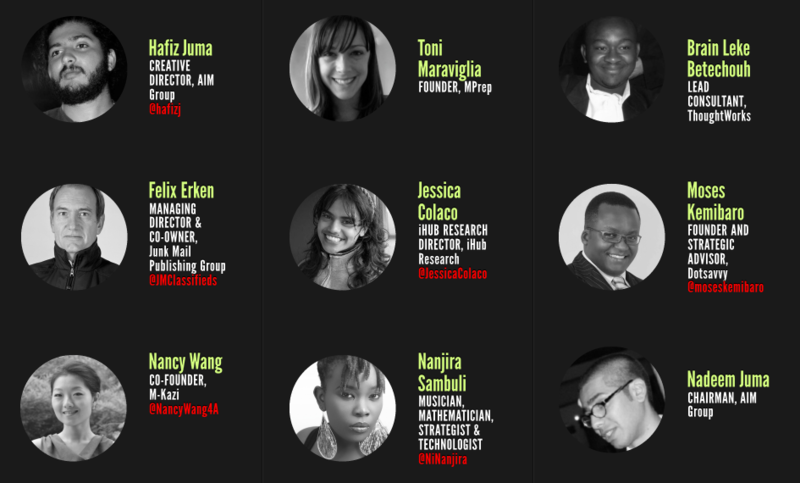 Juma is also the co-founder and chairman of AIM Group, the first new media agency based in Tanzania. How we made it in Africa’s Dinfin Mulupi engaged the self-confessed serial entrepreneur on digital marketing, Tanzania’s technology sector and the ‘dos and don’ts’ that investors should be aware of before entering Tanzania.